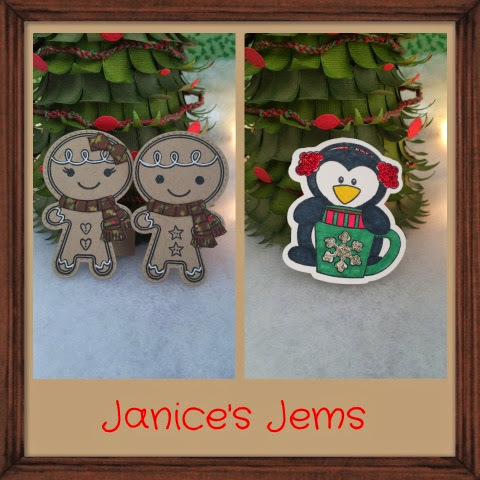 Jaded Blossom: Guest Designer, Janice! 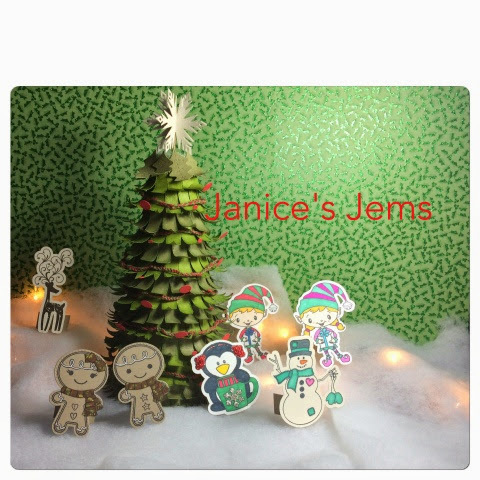 Janice here, from Janice's Jems! I am truly honored to be part of the Guest Design Team this birthday month! I am here to share my project I created featuring some of my favorite Jaded Blossom products! I made a Winter Village. I cut out 4 different tags from the Mini Tag Dies. The top layer I used the leaf from Christmas Dies. My tree topper was cut out with the Snowflake Dies. The ornaments were the stitched circle die (for the holly) from Christmas Dies, and the small circle was cut out using the Spring Dies. Here is a close up of the tree. I crocheted garland using Holly Berry twine from Trendy Twine. 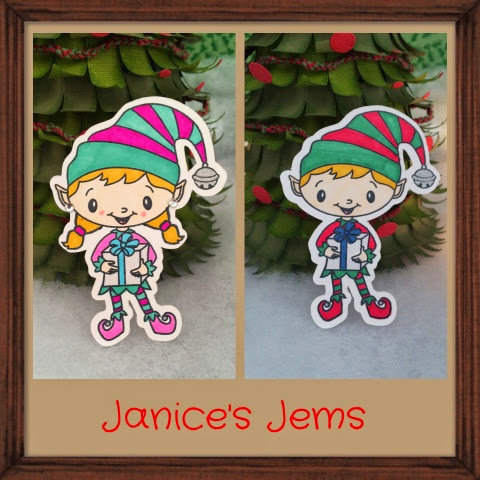 Here are the super cute elves from Elf workshop stamp set. The little gingers are cut with a die & stamped from Gingerbread Wishes. The cute little penguin is from Winter Penguin. Thank you so much Candace & Michelle for letting me post today! Please feel free to stop by my blog & become a follower if you liked what you saw today! OH WOW! This is AMAZING! 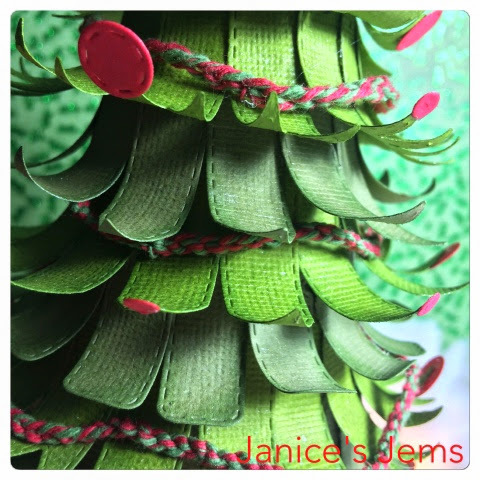 That tree is so cool and I love how you used the dies to create it! Each little character is adorable too! Awesome job! WOW! So many cute ideas for Christmas! Janice that tree is amazing!!! Just love it. Your coloring on all your characters is gorgeous! Fantastic project!!! This is amazing! What an awesome job on it all. I love all the little touches! You Rocked This!!! Very cute!! 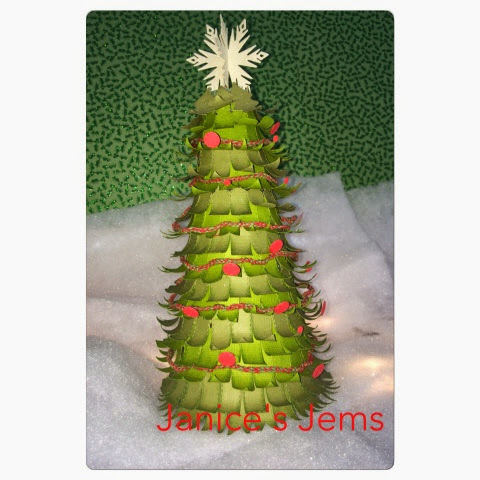 Love how you made the tree! Wow! Love it... the tree is fab...this is so festive. Such a fantastic tree! It is very creative using the dies the way you did! And great use of the Trendy Twine as well! pretty cool and creative! Love it! Oh how cute is this. Such a great and creative way to use those dies. Gosh - just love your Christmas Tree! love the tree and it's garland. Wow! This is a fantastic idea to think outside of the box! This is really cute. Such cute and fun projects. Wow! Your tree is amazing! What a lot of work! Holy patience batman! Love this idea so great!